Blakeley Shea and Tony Pieper have joined former The Bachelor couple Ben Flajnik and Courtney Robertson and The Bachelorette couple Emily Maynard and Jef Holm in Splitsville. Rachel Truehart talks more to Reality TV World about Bachelor Pad and dishes on some of her fellow contestants, including Nick Peterson and Michael Stagliano. Nick Peterson, who claimed all of Bachelor Pad's third-season prize money, talks about the show and his decision to keep the money -- including whether he and Rachel have reconciled and become friends again. Bachelor Pad crowned Nick Peterson and Rachel Truehart its winning couple during Monday night's finale broadcast of the third season of The Bachelor reality franchise spinoff in which 15 former bachelor and bachelorettes and five "Super Fans" competed for a $250,000 cash prize. Chris Harrison talk more about Bachelor Pad's third season and what viewers can expect to see unfold during Monday night's finale -- including whether Rachel Truehart's meltdown is a result of Jaclyn Swartz or Michael Stagliano's behavior. Bachelor Pad eliminated two pairs of contestants and determined its third-season's final two couples during Monday night's seventh episode of The Bachelor reality franchise spinoff. Bachelor Pad contestant Kalon McMahon talks Bachelor Pad and Lindzi Cox -- including why he fell for Lindzi so quickly but had to "force" things with Emily Maynard. 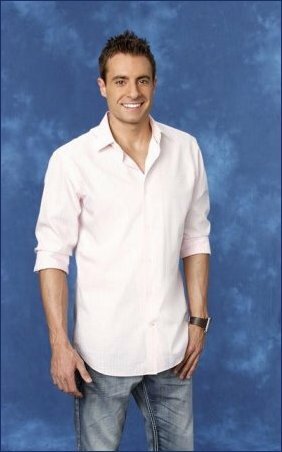 Chris Harrison says Bachelor Pad contestant Ed Swiderski naturally but unintentionally adds fuel to every fire. Bachelor Pad eliminated Kalon McMahon and Lindzi Cox during Monday night's sixth episode of the third season of The Bachelor reality franchise spinoff in which 15 former bachelor and bachelorettes and five "Super Fans" compete for a $250,000 cash prize. Erica Rose wraps up her discussion on Bachelor Pad -- including which couples she said are still currently dating since the show filmed and whom she noted she's "definitely not" friends with now besides the obvious Michael Stagliano.